Carlsberg is a Danish beer brand founded in 1847 by J.C. Jacobsen. It is part of the Carlsberg Group portfolio which also includes Tuborg, Kronenbourg and Somersby cider, as well as Carlsberg Export and Carlsberg Black Gold. Carlsberg has a significant heritage. And, like many other beer brands, has largely conveyed this using the visual language and associated legacy of the beer bottle label, which then made it on to cans. Carlsberg has begun a steady move towards a more current visual expression. This is characterised by a concise communicative intention and a stylistic minimalism. 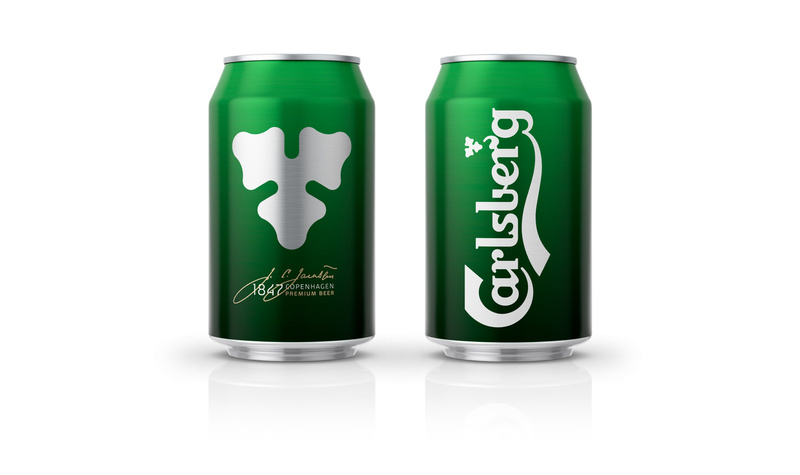 This can be seen, initially, in the packaging design of the Carlsberg can for the German market, created by Copenhagen-based studio Kontrapunkt, and in the redesign of Carlsberg Black Gold, also by Kontrapunkt. Black Gold is a dark pilsner, brewed in the same manner as Carlsberg’s premium variety, only for longer, giving it a richer flavour profile and higher alcohol content. This difference is conveyed immediately using a black and gold print finish. REF is an environmentally conscientious Swedish hair care brand with a range of products that are made from high quality organic ingredients. With a desire to enter the international market of the US and further into the Nordic regions, both dominated by well-established FMCG, Scandinavian design studio Kurppa Hosk were commissioned to rejuvenate REF’s visual identity. This included packaging design, art direction, stationery, business cards and web design. These are linked by what the studio describe as a system of simplistic graphic elements and a modest earthy colour palette.